Lakshmi Pooja is the auspicious day when Goddess Lakshmi is worshipped in all Hindu families to attain her blessings and particularly for better wealth. 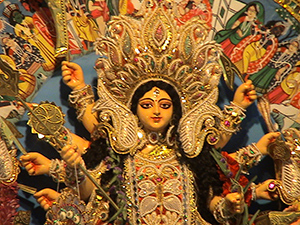 Lakshmi Puja is one of the main events during Diwali. Although, this festival is celebrated all over India Lakshmi Puja is a prime event in the Northern and western parts of India. 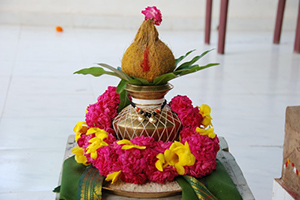 Lakshmi Puja celebrations take place in the dark night of Amavasya. It is believed that on this day Goddess Lakshmi visits to earth to shower her blessings on mankind for prosperity. The goddess of wealth and money known as Mahalakshmi. The goddess of Wisdom known as Mahasaraswati. The treasurer of gods called Mahakali. On Lakshmi Puja, women clean their homes, beautify them with rangolis (floral drawings with powdered colors), and decorate homes with other glittery decorations. One of the major rituals on this day includes adorning the idol of goddess Lakshmi on a platform with silk and jewellery. The Indian Pooja room is also decorated exquisitely. Delicious Bengali recipes are prepared on the night of Lakshmi Puja and offered to the Goddess. Nowadays, a variety of Bengali sweets are available in the market and also in online gift shops, which are offered for the Puja, distributed among all present for the Pooja and also sent to friends and family who reside far away. If you are holding Lakshmi Puja at home, then you must send invitations to your near and dear ones. Sending invitations for Lakshmi Puja has becomes so much easier now with online invitation tools like Yooite.Com. With Yoovite you can send the invitation to several people at once and also get responses from your invitees then and there. Celebrating Lakshmi Pooja with Yoovite is really easy! Get your house adorned for the big day and invite all your friends and relatives to seek blessings from Goddess Lakshmi.